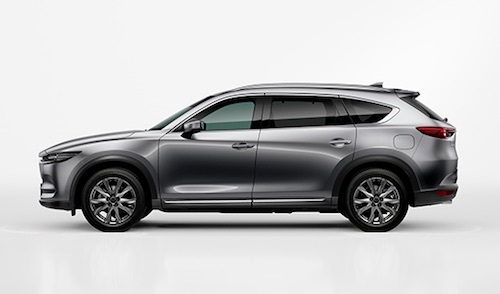 The CX-8 is the flagship model of Mazda's SUV lineup in Japan. The three-row crossover SUV offers a new alternative for customers who don't want to compromise on driving performance or styling in a multi-passenger vehicle. Since the car's December launch in Japan, orders have exceeded 20,000 units. The model is especially popular with customers in their 30s and 40s. Large SUVs are in great demand in China, the world's biggest market for automobiles, and exhibiting the CX-8 there will allow Mazda to introduce the car to customers in China and other nations. In line with its "Sustainable Zoom-Zoom 2030" vision for technology development, Mazda aims to use the fundamental appeal of the automobile - driving pleasure - to inspire people, enrich society and help bring about a beautiful earth. By offering an experience of car ownership that celebrates driving, the company hopes to enrich lives and build a strong bond with customers. (1) A press preview is scheduled for April 25 and 26; an industry preview will be held April 27 and 28.